The moment you all (well, mostly me) have been waiting for… THE GIANT RUBBER DUCK POST. I have been following this little big guy for at least a month before my departure to Hong Kong. If there was one thing I had to see while I was here, it would have been the duck. I was sooo excited when I found out that he and I would be in this city at the same time and I honestly felt like crying when I found out he had deflated. Just ask my roommate. And yes, I have given him a male pronoun. While some lucky ducks (pun intended) on our program got to explore the city a few more days before starting their internships, I was stuck at work for a week. I was super jealous of everyone that got to see the duck before me because some of them didn’t even know he existed until they got here. If there was anyone who deserved to see the duck it was me! So on Friday I made it my mission to see the duck after work-related obligations because I already had plans to go to Macau on Saturday and the duck was leaving on Sunday. It was a bit of a journey but eventually I made my way to him. 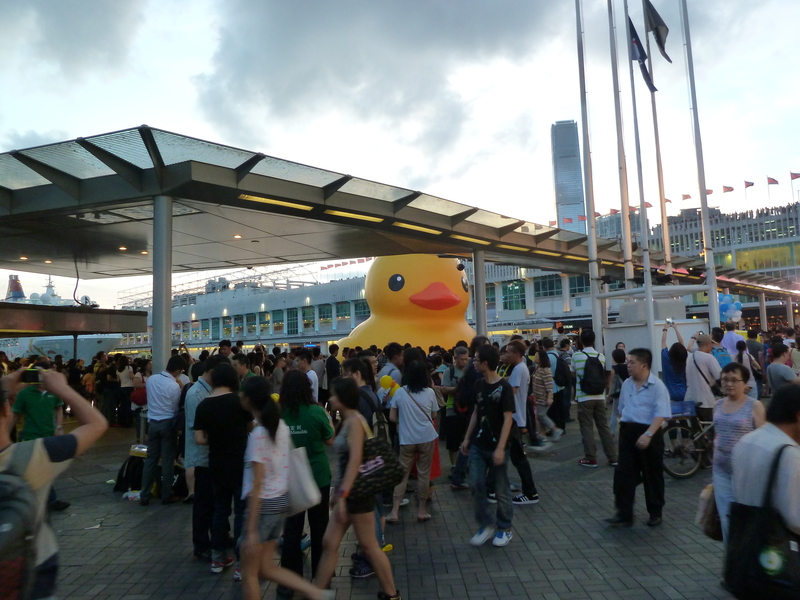 Although seeing the duck was my one mission, I was much more amazed by the atmosphere that surrounded him. I might have visited on one of the busiest nights because he was leaving so soon. I loved how he just brought happiness and joy all around. The rubber duck is such a symbol for childhood and innocence and I loved how people united over it. Everyone was smiling, laughing, and taking photos. There were also people from all around, not just China and Asia but tourists from Europe and America as well. Pictures can only do so much justice, so I made a video! This is a big change from my usual blogging medium so don’t judge me if it’s horrible. I thought it was pretty artsy-fartsy. When I got to the front of the crowd I was able to take some really nice photos. How could I miss out on this opportunity to take a panorama shot? Afterwards I took the ferry back to Hong Kong Island. I was actually really glad I was able to do this at night because then all the buildings were lit up. JK DON’T WORRY PARENTS/GRANDMA/EVERY OTHER FAMILY MEMBER/RESPECTABLE PEOPLE I ADMIRE. I DIDN’T DO ANYTHING DISHONORABLE. Also, I have to hear about Lan Kwai sometime!!! ← Lost in Hong Kong?